Four years ago, I got my first insulin pump, the Medtronic 530G. After four years, your pump goes out of warranty. At that time, you’re able to upgrade through insurance. 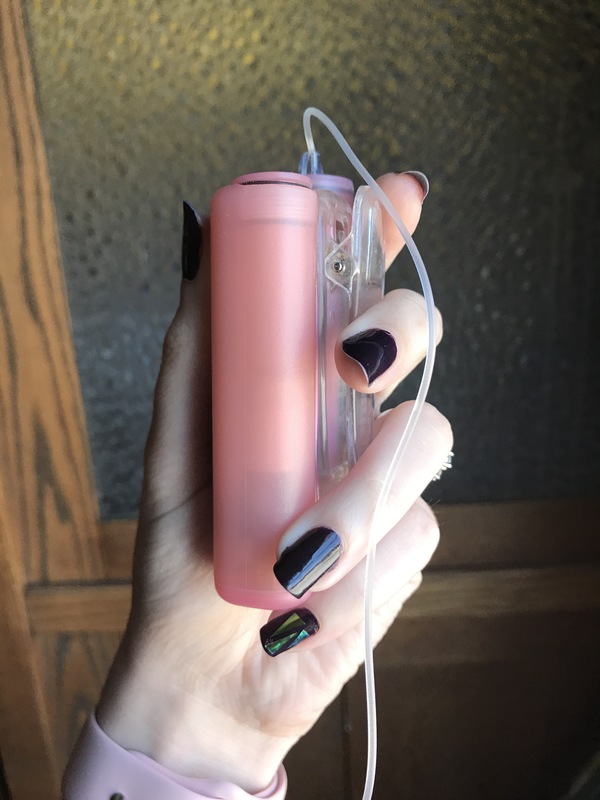 So, back in July, I began the process of getting my new pump even though I wasn’t out of warranty until December. (Of course, the Tandem rep laughed at me in July because it was way too early to even start paperwork or anything). After 3 weeks involving 37 phone calls (no joke! ), I finally have my new insulin pump in hand: the Tandem T-Slim X2. I’m so obsessed with this pump. It’s rechargeable so I don’t have to worry about always having spare AAA batteries on me. It syncs right with my Dexcom G5 so if my phone dies or gets misplaced, I can still monitor my blood sugar. It’s touch screen and doesn’t look like a damn pink pager. I recently upgraded my Dexcom system to the G5, which has allowed me to ditch the G4 receiver. 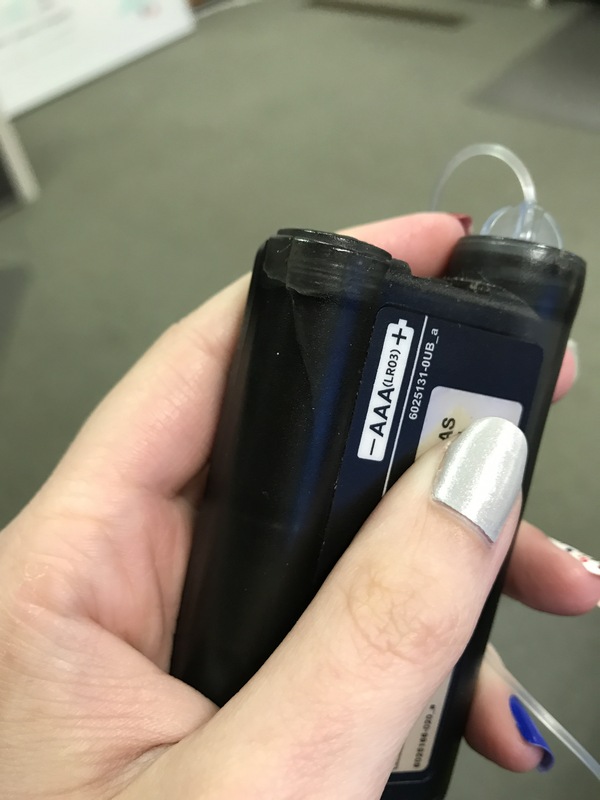 However, I still had some juice left in my G4 transmitter, so I asked Allen if he would be willing to wear it for a week – Just for a fun comparison of his blood sugars versus mine. If you know my husband AT ALL, then you know he’s completely squeamish when it’s his own blood, but mostly fine when it’s someone else’s. He inserts my sensors without fuss, and goes with me to my quarterly blood draws, but when he had to get his blood drawn for a physical at his work, he passed out. So I figured he would say no to my proposal, but I was thrilled when he agreed to be my pincushion for a week. He agreed knowing full well that he was committing to the initial insertion plus calibrations. When he was finally ready to do the insertion, we got comfy on the bed, with a bucket in case he puked, and we got to work. I don’t usually insert Dexcom sensors, but I know most of how it works, so I stuck it on, and prepped him for the actual insertion. Luckily he didn’t flinch, and I quickly pulled the inserter off. There was a little blood but not too bad. He let me know that it didn’t hurt and he was doing okay. But then I had to insert the transmitter piece. There’s a little plastic arm on the sensor base that makes inserting the transmitter easier. However, that piece had fallen off as it sometimes does, which makes the transmitter insertion harder. So when I tried to insert the transmitter, I had to push really hard. Thankfully, a few minutes later, he and I both calmed down. He pulled up a YouTube video to distract himself and I quickly jimmied the transmitter into the sensor base without any more fuss. The first day, Allen ran high for a non-diabetic, but I think the readings were not accurate. There was probably a bad initial calibration or something, and once we added a few more calibrations, it fell into range. The most interesting part was how steady his lines usually were compared to mine. I expected that he’d hover in the 80-100 range all the time, but not that he’d stay so completely steady even when eating high carb meals. Even his “dawn phenomenon” wasn’t actually that – he had eaten right before sending me this screenshot below. A typical non-diabetic and a typical diabetic for 24 hours. The difference was amazing. I even found myself trying extra-hard to be in a “normal” range to compete with him. Of course, I failed miserably, but it was a great experience. 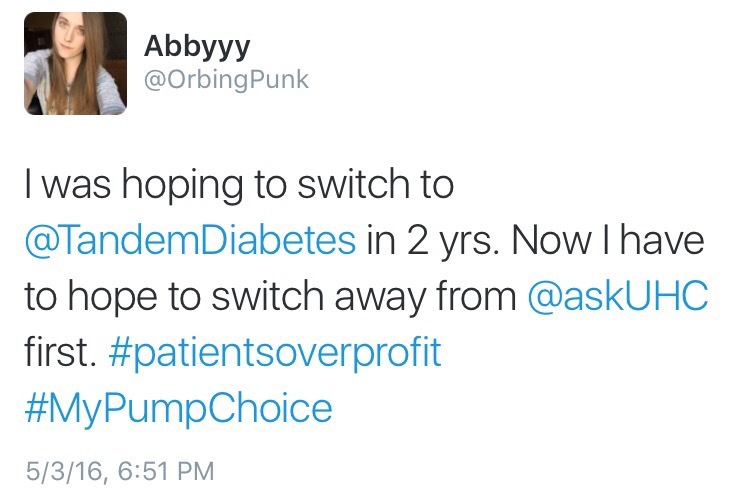 Even if you and your doctor decide a different company’s insulin pump is right for you, you won’t be able to get it through UnitedHealthcare unless you pay out of pocket for it, because their preferred company is now Medtronic. This is kind of like how the insurance companies currently dictate the brand of meters and test strips you’re able to get. And it’s bad news bears for those with T1D and UnitedHealthcare. When an insurance company dictates my therapy, they’re possibly inhibiting my quality of life. If I have to be attached to a medical device 24/7 for 4 years, I want it to be 1) something I like and 2) something that works for me. 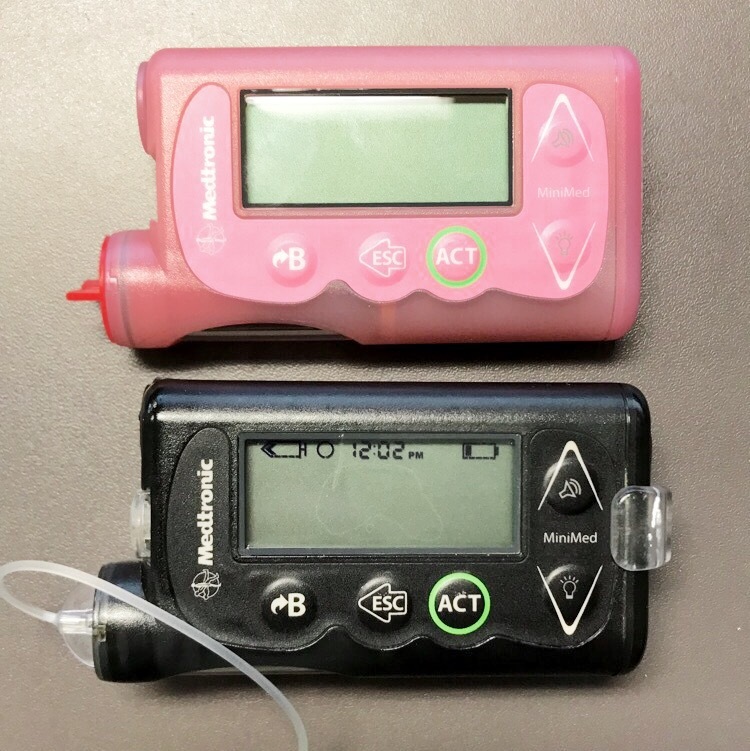 And my diabetes is not the same as others’ diabetes, and pumps are not one-size-fits-all. I appreciate Tandem immediately issuing a statement. Their CEO is quoted in the image below, and I couldn’t agree more. If this is the new direction medical insurance and healthcare is going, then it’s going to get really, REALLY bad for us. It’s not like I can very easily (if at all) choose a different insurance provider that works with the pump company I prefer! Well, I’m making as much noise as possible on social media. And a lot of others are too. I’m tweeting with the hashtags #mypumpmychoice and #patientsoverprofits and tagging UnitedHealthcare in those tweets. I’m sending information on this change to every diabetic I know so they can make noise too. It may be a dull roar right now, but this is very quickly blowing up. I’m hoping for a firestorm, and for UHC to realize how asinine, degrading, and greedy their new policy is. I reached a new level of low blood sugar last night – not in terms of actual mg/dl number, but in the events that transpired. When I went to bed last night, my blood sugar was a little high but on its way down. I woke up twice to correct for the low in the night, eating a total of three rolls of smarties. Then at 3am, my husband rolled over and woke me up, complaining that both my Dexcom and my Enlite cgms were alarming (because I’m running both at the moment for a future blog post). In my low and half-asleep stupor, I yelled at him that I had already eaten a bunch of smarties, before I finally rolled out of bed to get a glass of milk. 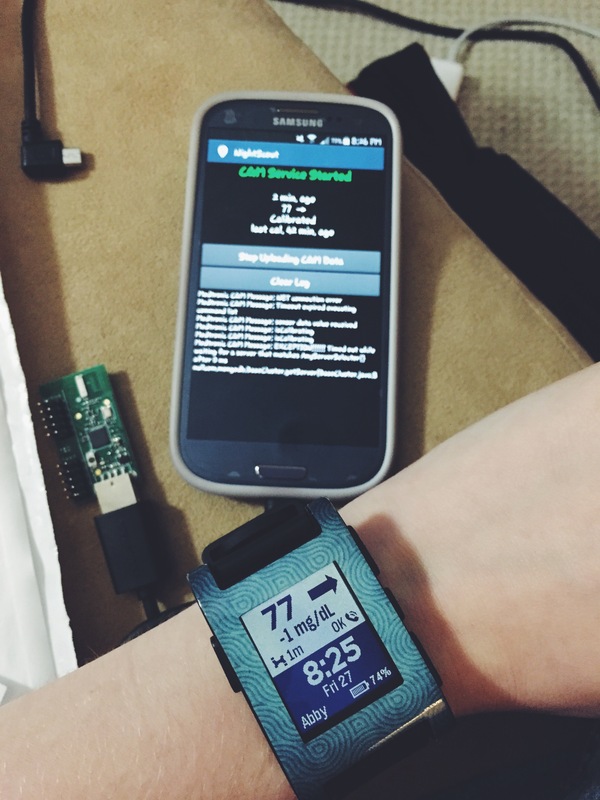 I made it to the kitchen, tested my blood sugar (72) and calibrated both cgms. 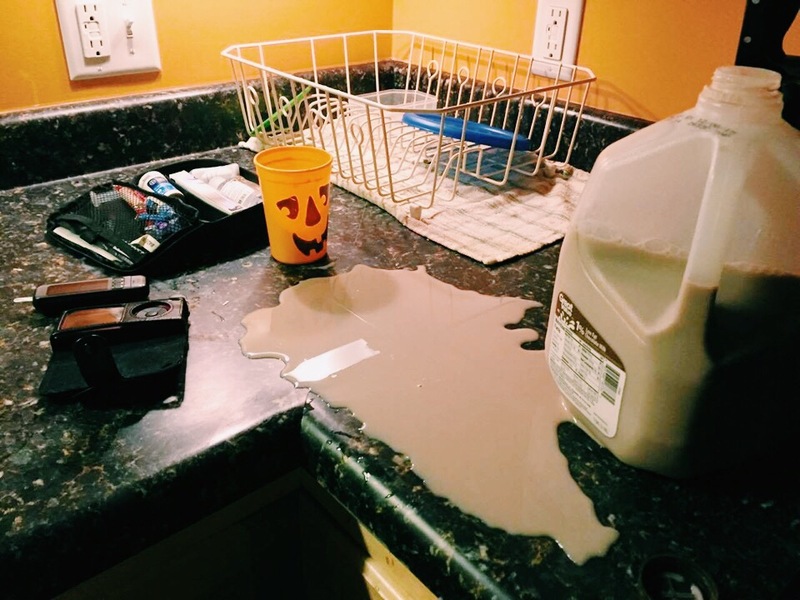 I grabbed the chocolate milk and began pouring it into a glass. But I started to feel weird, like I was going to pass out. 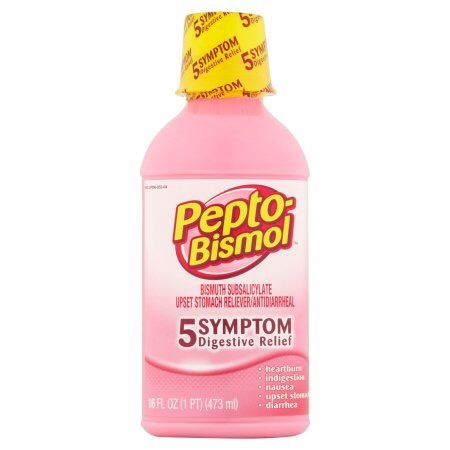 I raised the glass up to my lips and immediately it fell out of my hands and spilled all over the counter, the floor, my dexcom and myself. The room was spinning. I stumbled and sat down on the floor of the kitchen and mustered up enough strength to yell for my husband. Allen jumped out of bed and, seeing what had happened, quickly poured me a new glass of milk. He got a towel to clean up the mess, and also grabbed his phone to snap a picture of the mess, because he knew I’d want it for my blog. Meanwhile I sat in a ball on the floor, drinking my milk and trying not to cry. I was so embarrassed that I had lost control like that, especially when I wasn’t even all that low! But every low is different and diabetes is still unpredictable. I’m just thankful that the cgm technology I am lucky enough to have did its job and woke Allen up. Having been diagnosed with type 1 diabetes at age 22, I was thrust into a whole new world in my already established life. I was married, freshly graduated from college, working as a low-level manager at a big box store. For those first 6 months or so, I was completely on my own in this new reality. Any time I tried finding info on what to expect as a newly diagnosed adult T1, I’d only be able to find things parents had written about their newly diagnosed kids, or adult T1s who had been diagnosed as kids. There are so many things I wish I would have known, so I’ve compiled them into this list. The Enlite CGM system was the reason I ended up getting the Medtronic Minimed 530G as my first insulin pump in December 2013. I really liked the idea of only having to wear one device on me at all times. And the Dexcom wasn’t compatible with the pump I really wanted, the Tandem T-Slim. So I ended up trusting my endo and went with the 530G with Enlite. A few months after receiving my pump, I heard about Nightscout for the first time. 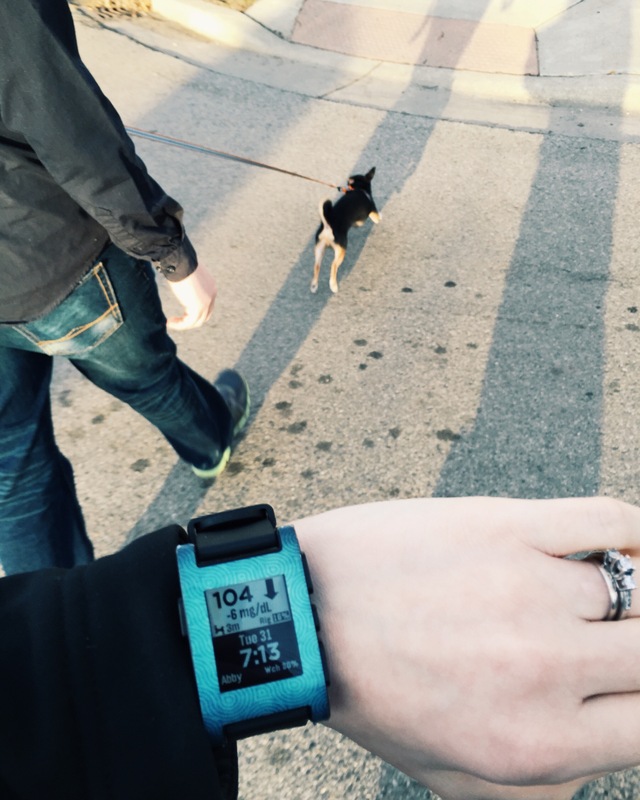 It was a Dexcom exclusive movement in the early days. I became a lurker on the CGM in the Cloud Facebook page, waiting anxiously for the day that Nightscout would work with my Enlite. And finally at the end of 2014, I was notified that Nightscout for Enlite had been born and was testing. It took me a few months to get the supplies, but eventually, I was in the Cloud with a rig of my own! The other day I saw an article in Time saying that The United States is the most expensive place in the world to live with type 2 diabetes. 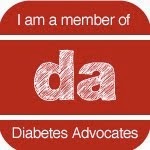 It got me thinking that I haven’t discussed the financial burden that comes with being diabetic. This is a standard bottle of insulin. Everyone’s usage varies, but I usually use 1 bottle per month. Being type 1 diabetic, I must take insulin every single day or I will die. 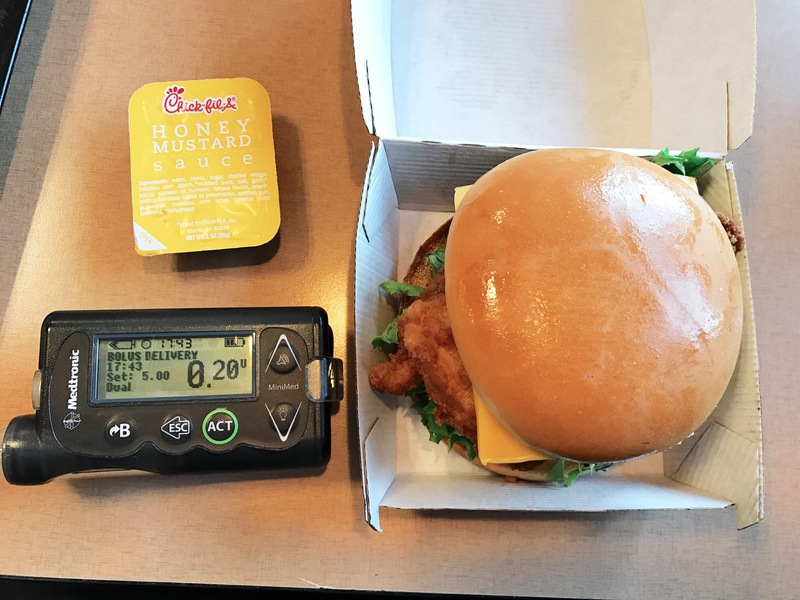 So how much does insulin cost? Earlier this week, my husband picked me up from work with a surprise – he was taking me to the hot tub place about an hour away for an evening of relaxation. I was thrilled! But it was our first time going since I began using the pump, and I knew it would be an experience to remember. I had been fighting a relentless high all day, and when I settled in the tub to begin the hour long soak, I was at about 160. After only 20 minutes, I got out of the tub because it was hard for me to speak. 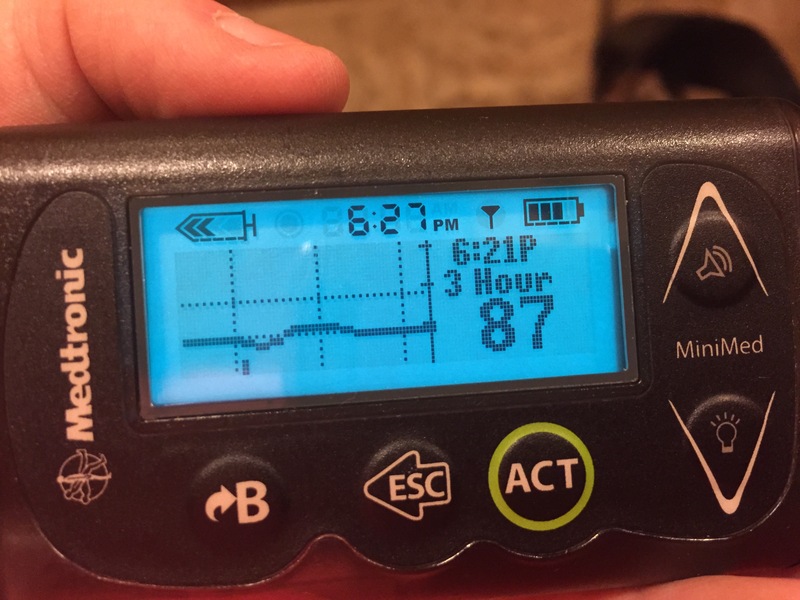 My CGM was reading 126. A finger poke showed I had actually dropped to 55. That’s 105 points in 20 minutes. Of course, the CGM can’t even come close to catching a drop like that fast enough. Luckily I had trusted my instincts and knew to watch for signs of my sugar dropping. So how did this happen? The heat from the hot water causes insulin to work faster, meaning the glucose in my blood was being taken into my cells at an accellerated rate. I didn’t feel the 55 like I normally can feel my lows due to my senses being overwhelmed by steam and heat and bubbles which is why I only noticed I was low when it was suddenly difficult to form a coherent thought. All is good though. I enjoyed some relaxation, even when I had to stuff three rolls of smarties in my mouth while sitting in the tub. Tis the life of a diabetic. 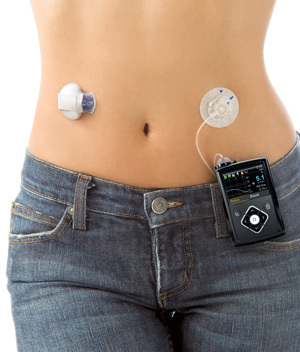 But a lot of news outlets have been touting it as an “artificial pancreas.” But is it really?